David Bonter is assistant director of Citizen Science and former FeederWatch project leader at the Cornell Lab of Ornithology. Above, he fills a feeder in the Lab’s bird garden. Photo by Gustave Axelson. Does Feeding Birds Impact Bird Populations? 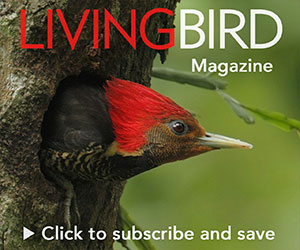 Nearly 53 million Americans feed wild birds, stocking home feeders with more than $5 billion worth of seed each year, according to the most recent government recreation survey. The wild-bird-feeding industry estimates that this amounts to about four billion pounds of seed a year! That’s a lot of time, effort, and money spent to bring birds closer, but we also need to be good hosts. We spoke with the Cornell Lab’s David Bonter about how to keep our feeder birds healthy during the warm summer months. Does birdseed spoil more quickly in the summer? Yes it does. Any time you combine food and moisture, you have the potential for mold to develop—the seed will just soak up the moisture from the air. Some molds produce a byproduct called aflatoxin, which is fatal to birds. Though not all molds produce aflatoxin, there’s no way to tell whether the mold on your seed is one that does. We wouldn’t eat moldy leftovers so we shouldn’t give anything like that to the birds either. The key is not to put out lots of feeders packed to the top with food, which will then sit for long periods during the hot, humid days of summer. You need to be sure the food is moving through the feeder pretty quickly to prevent mold from forming. Make sure you keep your stockpile in a cool, dry place. If you find any mold on your seed, in either the feeder or storage container, get rid of it. Can bird feeders cause sickness in other ways? We often hear of big outbreaks of salmonellosis—which is any sickness caused by salmonella bacteria. There are thousands of different strains, and it is everywhere in the environment. Humans can get sick from it, too. Among birds, it’s spread through seed or other foods that are contaminated with droppings from a sick bird. Is there any way to reduce the likelihood of salmonellosis? We suggest that people move their feeders more often. If you keep them in one place for a long time, the seed hulls can build up, and so do the droppings. You can maintain a safe, clean feeding environment by moving feeders and not allowing waste to concentrate in one area. Wash the feeders if you see any sick birds. Can suet go bad in warm weather? The unrendered chunks of raw suet you can sometimes get from a grocery store will become rancid in warm weather. Prepackaged suet cakes can also melt in the heat and harbor mold and bacteria. Some of the prepackaged cakes come in “no-melt” varieties. They’re rendered (cooked down) multiple times so the cakes stay solid at higher temperatures. Placing suet in a shady spot also helps. Hummingbird nectar never lasts long and can go bad even more quickly on hot days. The liquid looks cloudy when it ferments. Change the nectar every three to five days—more often if it’s really hot. Use small hummingbird feeders that the birds will drain fairly quickly so the nectar doesn’t sit around. How can you tell if a bird is sick, and what should you do if you see a sick bird? Birds that are not feeling well tend to sit very still, with puffed-up feathers, and they may have partially closed eyes. Generally, human intervention is stressful for birds, especially if they’re already sick. And humans can get salmonella, too, so handling sick birds is not a good idea. It’s also illegal to keep wild birds in captivity in the Unitied States without a special permit. You should move and clean the feeders, but leave the bird alone. Some of them do recover from these illnesses. We’ve found birds with salmonella antibodies in their systems, so we know that they’ve had the sickness before and become well again. Are we doing more harm than good when we feed birds? There’s no way to know how many birds die after becoming ill at feeders. But so many of the species in North America that are doing really well—with populations that are increasing or stable and ranges expanding—are feeder birds. So I’ve got to think we’re not hurting the birds by feeding them.